But for now, it’s summer where I live, so I’m extolling the virtues of this Asian Chicken Salad with Spicy Peanut Dressing as a warm-weather salad. This recipe is perfect for summer, in my opinion, because it’s got the inherent lightness of a salad (YAY, plant-packed power! ), but it’s still way hearty, too. So if you are doing a little enjoying-of-adult-beverages-on-a-patio, you can whip this Asian Chicken Salad with Spicy Peanut Dressing out and get some sustenance into everyone before they wither away in the heat in a stupor of empty-bellied tipsiness. And BONUS: it’s a perfect salad to prepare in advance because it will keep well in the fridge, even if you mix the dressing in ahead of time (raw cabbage is an all-star like that; it’s doesn’t get wilty!). Plus, this recipe yields a large amount: about eight servings – awesome for when you’re entertaining a crowd. And even if you’re not entertaining a crowd, this Asian Chicken Salad with Spicy Peanut Dressing is the kind of thing you won’t mind eating leftovers of for days and days (believe me, I know – between the two drafts of it that I’ve made, I’ve been eating this salad for over a week and am STILL not tired of it. In fact, I’m getting ready to eat another bowl of it post-posting this. YUMMM). 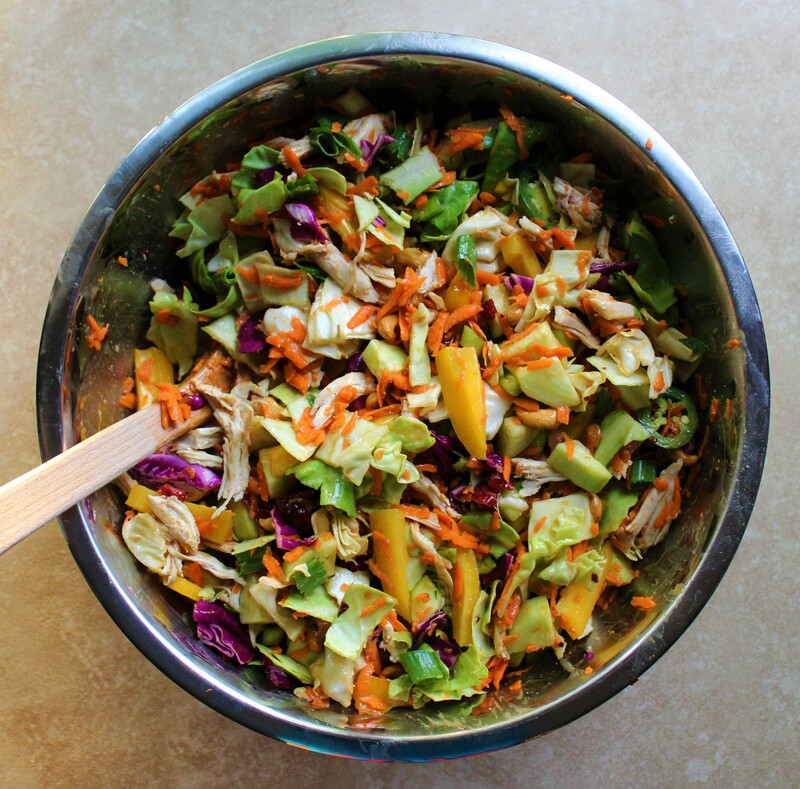 What makes this Asian Chicken Salad with Spicy Peanut Dressing so specifically delicious? Well, for one, the dressing is AMAZING. It’s creamy and spicy and peanut-butter-y. Given that I’m pretty much obsessed with peanut butter and eat it straight-up out of the can on the daily, it’s not a surprise that I was yet again looking for an excuse to sneak it into a recipe. And this Spicy Peanut Dressing was a REAL good manifestation of that. If you’re not into spicy, you can easily make the dressing un-spicy by omitting the red pepper flakes. The blend of various fresh, vibrant vegetables in this Asian Chicken Salad with Spicy Peanut Dressing also does it for me. 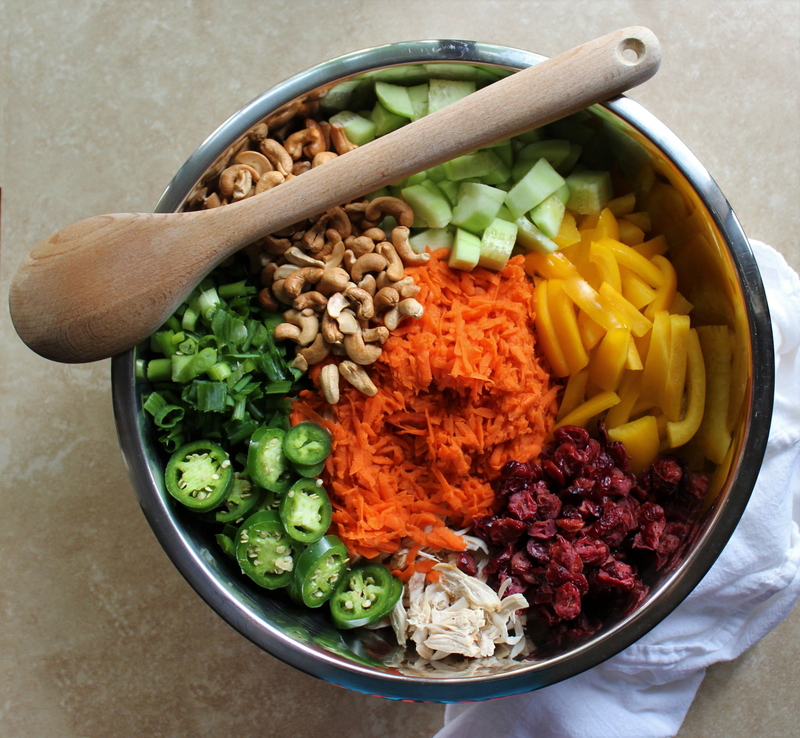 We’ve got hearty chopped green AND purple cabbage here, sweet shredded carrot and dried cranberries, crunchy yellow bell pepper and cucumber, spicy jalapeños, bold green onion, savory pulled chicken, and my FAVORITE favorite ingredient, deliciously-addictive roasted cashews (I’m that person standing at the salad bowl trying very hard not to pick out and eat every cashew). If you’re interested in fresh-roasting your cashews for this recipe rather than buying them already roasted – totally worth the approximately 15 minutes it will take to do so – check out my recent Creamy Chocolate Cashew Butter recipe post, which includes instructions around this. Speaking of recipe prep, if you are looking to roast your own chicken to provide the pulled chicken for this recipe (and have extra! ), my Classic Roasted Chicken recipe post provides an easy how-to on this matter. OK, on to the recipe and colorful, flavorful, belly-filling, energy-sustaining goodness! Add dressing ingredients to a mason jar or other container with a secure lid and shake well. Pour dressing over the salad and toss to coat evenly. And you're done! 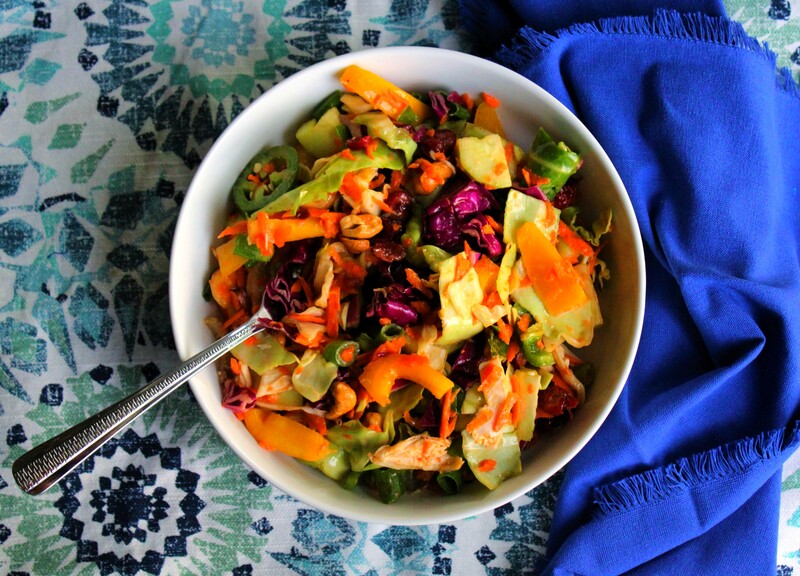 You have a vibrant, nutrient-rich salad to enjoy.